Adolfo Celi (Italian pronunciation: [aˈdɔlfo ˈtʃɛːli]; 27 July 1922 – 19 February 1986) was an Italian film actor and director. Born in Curcuraci, Messina, Sicily, Celi appeared in nearly 100 films, specialising in international villains. Although a prominent actor in Italian cinema and famed for many roles, he is best remembered internationally for his portrayal of Emilio Largo in the 1965 James Bond film Thunderball. Celi later spoofed his Thunderball role in the film OK Connery (aka Operation Double 007) opposite Sean Connery's brother, Neil Connery. Celi in La mala ordina (1972). Celi became a film actor in post-war Italy. He left the Italian film industry when he emigrated to Brazil where he co-founded the Teatro Brasileiro de Comédia along with the Brazilian stage greats Paulo Autran and Tônia Carrero in São Paulo He was successful as a stage actor in Argentina and Brazil. He directed three films in South America in the 1950s, including the Brazilian hit Tico-Tico no Fubá in 1952. Celi began a new popular career when he played the villain in Philippe de Broca's That Man from Rio, selected by de Broca on location in Rio de Janeiro. The popularity of the film led him to be cast as camp commandant Battaglia opposite Frank Sinatra and Trevor Howard's Allied POWs in the 1965 Second World War escape drama Von Ryan's Express. This led him to his most well known role as Largo in Thunderball. He is also known to international audiences as Ralph Valmont, one of the villains in the Mario Bava action thriller Danger: Diabolik and the celebrated Fernando Di Leo's poliziottesco film Hired to Kill (La mala ordina, 1972) as Don Vito Tressoldi. 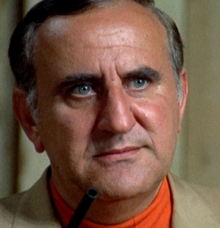 Celi appeared as a protagonist in some Italian comedies including Amici Miei and Brancaleone alle Crociate and did some television work, notably in mini-series Petrosino (1972), portraying the legendary Italian-American cop, and as the ruthless aristocrat, the Baron of Carini in another very popular mini-series, La Baronessa di Carini (1975). In addition to his native Italian, Celi was fluent in several languages, including English, Spanish, French, German and Portuguese. Despite his proficiency in English, his thick Sicilian accent meant that he was usually dubbed when he appeared in English language films; however, he was not dubbed in the 1981 BBC serial The Borgias, in which Celi played Rodrigo Borgia. Celi was married three times. He died of a heart attack in Siena in 1986. His daughter by Veronica Lazăr, Alessandra Celi, is an actress. ^ "Adolfo Celi". NYTimes.com Movies & TV. The New York Times (All Movie Guide and Baseline). ^ Crowther, Bosley (22 December 1965). "Thunderball (1965) Screen: 007's Underwater Adventures:Connery Plays Bond in 'Thunderball'". The New York Times. ^ Crowther, Bosley (23 November 1967). "O K Connery (1967) Screen: Mr. Kennedy and Mr. Reagan:New Cinema Playhouse Changes Its Fare Picture Makes a Case for the Californian 'Operation Kid Brother'". The New York Times. ^ Adler, Renata; Thompson, Howard (21 February 1968). "Movie Review". The New York Times.